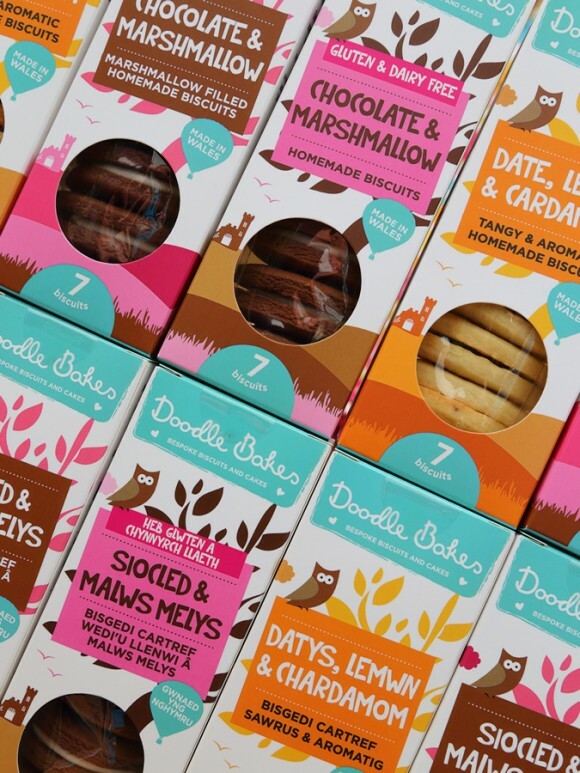 Bespoke Montgomery biscuiteer Doodle Bakes has launched into the retail scene with a new range of bilingually packaged biscuits. It has been a rapid rise for Doodle Bakes, which was started by busy mum Nicky Markham in her kitchen in 2011 making high quality, hand crafted, bespoke Royal Iced biscuits and cakes. The venture has been supported in its brand development by Cywain, a Welsh Government backed project to help bring added value to primary produce. Now Nicky hopes the launch of the eye-catching bilingual branding will widen the appeal of her bakes even further. Says Nicky, “With Cywain’s assistance I’ve been able to develop the bilingual branding and packaging. “The boxes are in Welsh on one side and English on the other so retailers have the option of displaying whichever version they prefer. She added, “We hope that customers may be tempted to draw comparisons between the two languages and endeavour to learn, read, and experience Welsh even at a sub conscious level. The Doodle Bakes story began at a family party. “Not long after we moved to the area and it was my son’s birthday, he wanted a pirate theme; so I made some cakes and biscuits for the party. A number of the mums asked me where I had bought them and I said I’d made them, and it went from there,” explains Nicky. An early visit to Ludlow Food Festival caught the attention of none other than society magazine Tatler which promoted Doodle Bakes in its Christmas gifts feature. “It was a great boost, but at that stage I’d only just started and didn’t even have a website,” says Nicky whose background is in education. However with a young son and a baby daughter time to bake in the daytime was limited. Nicky has created bespoke iced biscuits for all sorts of occasions and clients, using local, Welsh and responsibly sourced ingredients. “As a mum I try to produce products that appeal to all. I use as many local natural ingredients as can possibly be sourced and try to avoid artificial colours and flavourings. In addition to the iced biscuits Nicky makes ‘Button Biscuits’ filled with jam and marshmallow, which are sold in a number of cafes and tearooms. However, to get on to the shop shelves Nicky needed the right branding and packaging, which is where Cywain was able to help. 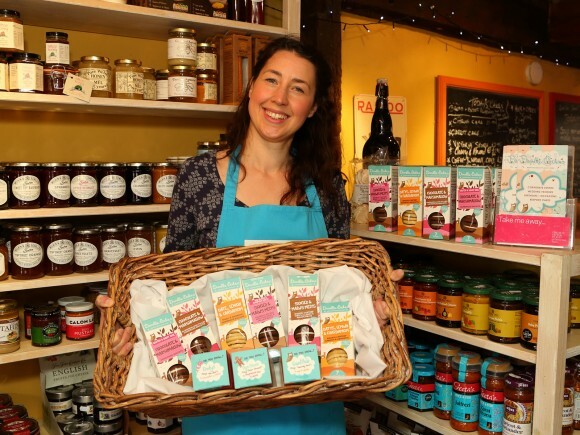 Says Nicky, “I am a member of Taste Montgomeryshire and the guest speaker at one of the meetings was Lowri Davies from Cywain, who said they might be able to help me take the business further, and it snowballed from there. There are three varieties of boxed biscuits to choose from – Chocolates & Marshmallow, Date, Lemon & Cardamom, and Gluten and Dairy Free Chocolate & Marshmallow. Nicky Markham of Doodle Bakes with her new bilingual packaging.